A BioBrick is a standardized biological parts made out of DNA that perform a simple biological function and can be incorporated into larger biological systems found within cells. 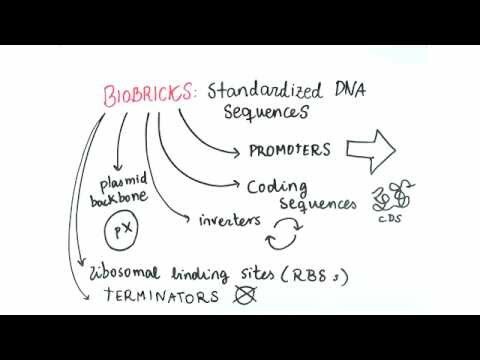 ​BioBricks help to advance the field of synthetic biology by enabling easy access to DNA sequences with a known, and standard function, that cam be included into the design of new biological systems for wide variety of applications such as: energy production, materials, therapeutics, and environmental remediation. ﻿Tomas Knight introduced BioBricks at MIT in 2003, and described them as standard biological parts for engineering new biological systems. Thomas Knights goal with BioBricks was to replace ad hoc methods of experimental design with a standard, and reliable, set of engineering mechanisms that would allow for for the assembly of simple genetic components into lager genetic systems. Since 2003 many people all over the world have been growing the BioBricks library of standard biological parts, and in 2006 a not-for-profit company was started help organize and accelerate the development of the BioBrick standard library called the BioBricks Foundation. 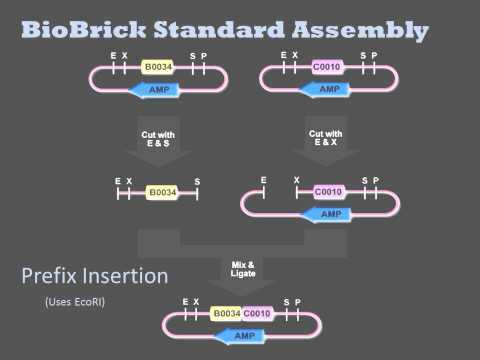 ﻿The BioBrick assembly standard is designed to allow the transformation of biological components into new biological systems using one standard transformation process that does not change, and leaves the important structural elements of the component intact. By using this standard, when a BioBrick component is successfully created it can be used indefinitely in the construction of future genetic assemblies.